Apple has thrown its hat into the ring with fellow technology and telecommunications giants Microsoft, Cisco, Verizon, and AT&T to oppose a federal court ruling that could force American companies to hand data about foreign customers over to the U.S. government in violation of international laws and treaties. Cupertino, Calif.-based Apple's participation comes in the form of an amicus curiae, or "friend of the court," brief filed jointly with networking equipment maker Cisco on Friday in United States District Court for the Southern District of New York. The filings were first spotted by GigaOm. Microsoft is appealing portions of a warrant issued by U.S. magistrate judge James Francis IV ordering the company to give U.S. authorities access to email data from an Irish customer. That data is held in Ireland, and Microsoft charges that complying with the order would force it to break Irish data protection laws. In earlier arguments, Microsoft suggested that the government could instead rely on the Mutual Legal Assistance Treaty between the U.S. and Ireland, in which both countries have agreed to assist one another on gathering and exchanging information for the purposes of law enforcement. Judge Francis rejected both tacks, leading to Apple's intervention. 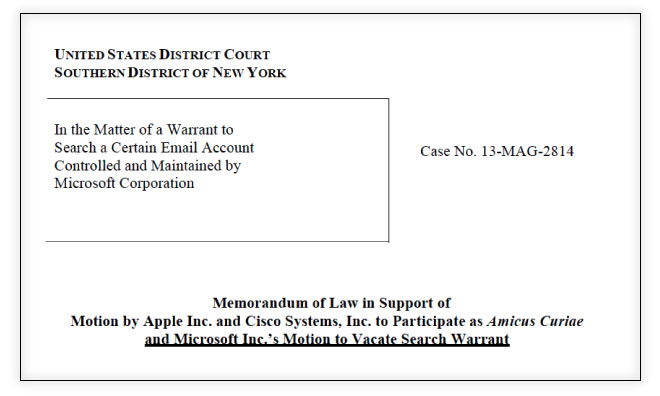 "In rejecting Microsoft's motion to vacate the search warrant, the Magistrate erred by failing to consider the conflicting obligations under foreign and domestic law that arise when courts order providers to produce data about foreign users stored in foreign countries," Apple and Cisco's filing reads. "By omitting this evaluation--and by dismissing the Mutual Legal Assistance Treaty ("MLAT") process out of hand with no factual findings regarding the Irish MLAT at issue--the Magistrate placed the burden of reconciling conflicting international laws squarely on U.S. providers." The companies go on to argue that upholding the warrant would place them and their employees at risk of foreign sanctions and could spur reciprocal legal actions on the part of international courts, putting the data of U.S. citizens in play. The relative safety of foreign customers' data in the hands of U.S. technology companies has become in increasingly important issue as Silicon Valley firms struggle under the weight of revelations about the magnitude of the National Security Agency's data spying apparatus. Microsoft's is the latest in a string of high-profile cases that has seen large companies —including Apple —flex their legal muscle to challenge what is widely seen as overreaching on the part of the federal government.